Sakai Guides and DocumentationAssessments and Grading AssessmentsHow can an instructor retrieve assessments that were saved but not submitted? When a student selects the Submit for Grading button on the last page of an assessment or the Table of Contents, they are taken to an Assessment Submission Warning screen to confirm their submission. If they do not select the final Submit for Grading button to confirm, and the assessment is NOT timed, their responses may be saved, but the assessment will remain In Progress. Instructors do not have access to the content of In Progress assessments. On the Scores screen, students with incomplete submissions would be listed as having No Submission recorded. However, if a student has not yet submitted a copy of an untimed assessment, an instructor will see the student's submission with the Automatic Submission (Autosubmit) feature in Tests & Quizzes. Auto submit occurs automatically at 4:30 AM EST each day. If all three conditions above are true, the system will automatically submit the students saved assessment. The submission data will be available to instructors on the Scores screen after the latest acceptance date passes each morning. If you are currently editing the Working Copy of the assessment, select the Settings link at the top of the assessment editing screen. When the assessment settings are ready, and the questions are in place, select Save Settings and Publish to publish the assessment so that your students can take it. See the article How do I publish an assessment (i.e. test or quiz)? Alternatively, if you're not ready to publish the assessment, you can select Save to save your settings selections. If Autosubmit has not run yet, some students' submissions remain In Progress, and those students have not already submitted a copy of the assessment, you can edit the Settings on the published assessment to trigger an automatic submission and access any responses they saved. At the bottom of the screen, select Save to save changes. Zoom: Confirm to Stop Accepting. You'll be shown a warning indicating that the assessment will no longer be available for students to take. If you're sure you don't want to accept any more student submissions, select Stop Accepting to confirm. Zoom: Wait for submissions to become available. If your assessment's latest acceptance date is in the past OR if you've chosen to Stop Accepting Now, In Progress assessments will be automatically submitted the next time Automatic Submission process runs. Why are some assessments still listed In Progress? Zoom: I enabled Autosubmit; why are some assessments still listed In Progress? Zoom: How do automatic submissions display? On the Scores screen, automatic submissions are flagged with the text AUTO-SUBMIT. 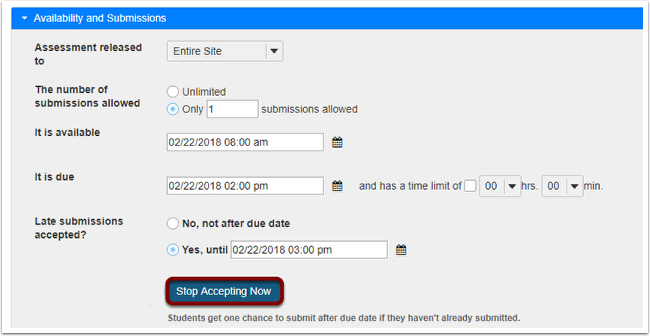 The time stamp that appears in the Submit Date column for automatic submissions indicates when the student last saved content in the assessment, NOT when it was actually submitted by the Automatic Submission feature. When an instructor accesses the Scores creen to grade the assessment, automatic submissions are flagged with the text AUTO-SUBMIT.